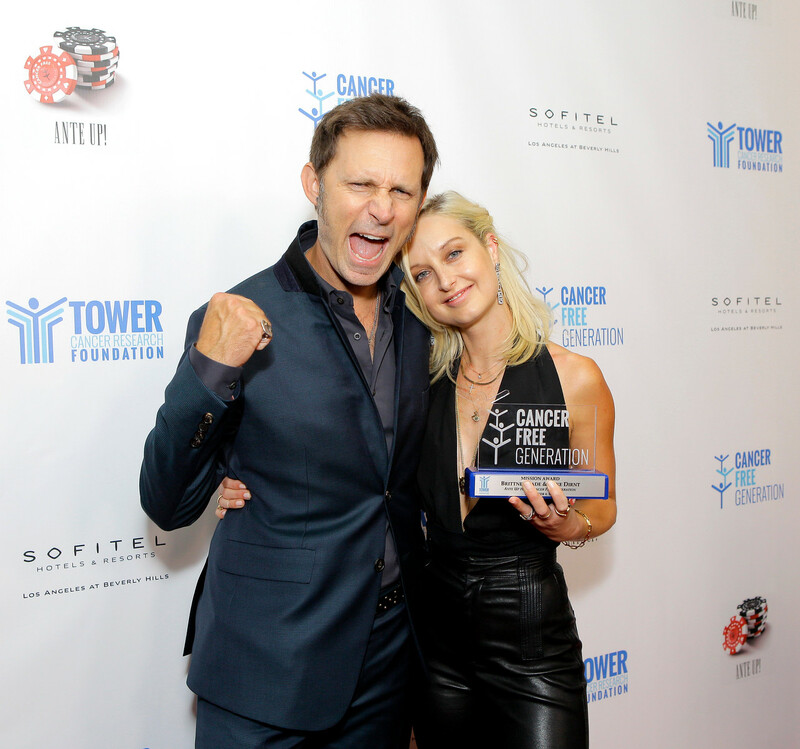 Following a tumultuous few years watching his wife, Brittney Cade Pritchard, battle breast cancer, Green Day bassist, Mike Dirnt, is thrilled to have her back in good health and determined to continue doing his part to help fight the deadly disease. Rock and Roll Globe caught up with the legendary bassist at the Tower Cancer Research Foundation’s ‘Ante Up for a Cancer Free Generation’ poker event in Los Angeles, where he and Brittney were honored for their efforts to share their story to help others. Proceeds from the event benefited TCRF’s Cancer Free Generation division, which funds innovative scientific research to conquer cancer. Brittney was diagnosed with breast cancer four years ago, news which devastated Dirnt, who was suddenly faced with keeping his family together while watching his wife fight a potentially fatal illness. Then there was the heartache of having to help their two young children, Brixton and Ryan, through the ordeal. Dirnt says Tower Oncology were instrumental in helping the family process the news and devise the best course of action for the couple, who tied the knot in Ojai, California, in 2009. Documenting her journey on Instagram, in what became a diary of her illness, Brittney persevered through chemotherapy, a grueling nine surgeries and endless appointments to kick the disease. Through social media, she has also become a go-to for other breast cancer patients wanting advice or encouragement. After being honored at the event, at the Sofitel Hotel in Beverly Hills, she took to social media to thank Mike for his support and encourage others fighting the illness to never give up. With Brittney having overcome cancer and Green Day frontman Billie Joe Armstrong meanwhile completing a rehab stint for alcohol and prescription drug abuse, the band seem to be doing great and returned to the scene with Revolution Radio in late 2016, before touring last year. The trio now appear to have more projects in the works, teasing fans with rehearsal updates on social media in recent months. The posts indicate the group have been practicing old albums, leading fans to speculate an anniversary tour, perhaps for 1994’s Dookie, could be on the horizon. Leena Tailor is an LA-based Kiwi journalist published on Entertainment Tonight, Billboard, Vogue, Rolling Stone, Marie Claire, Harper’s Bazaar, Sunday Star Times, Woman's Day. Follow her on Twitter @LeenaTailor.